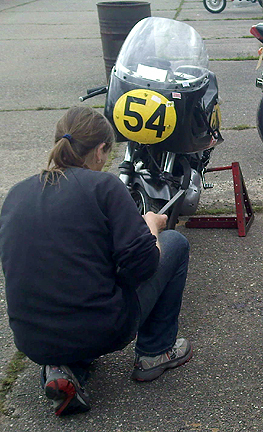 The bikes are almost ready to go, with the first meeting at MalloryPark on 26/27th March. This is perilously early in the year, and will very probably be cold and wet, but at least it is close enough for going home overnight if it's too horrible. 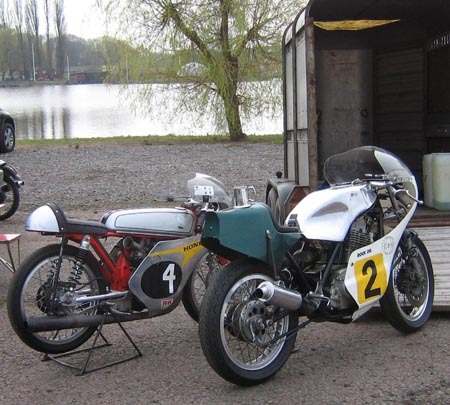 Next it will be a one-day meeting at Donington Park on May 2nd, Bank Holiday Monday, with Thundersprint the very next weekend. A different set of gear ratios for that are due to be tested in Sally's road Cub, if that works well there will be frantic swapping of bits during the first week in May. Well, although the beautiful Spring weather took a weekend off, it was better than we had any right to expect at this time of year. Practice was delayed while the mist cleared, and unlike last year both bikes got through that stage without breaking anything. 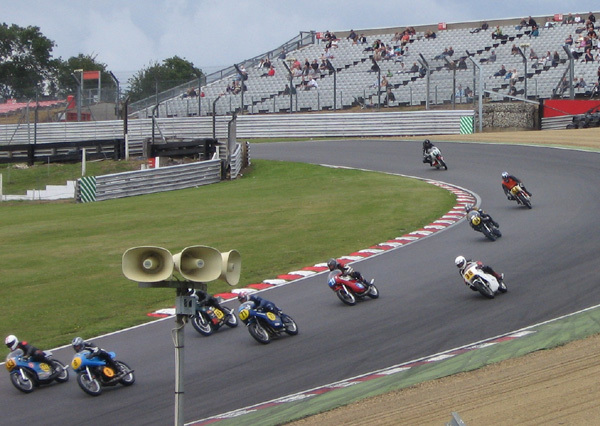 Starting from the back of the grid, the Cub was making progress when the first race was stopped - riders made a habit of falling off throughout the meeting, restarts and re-runs were frequent. 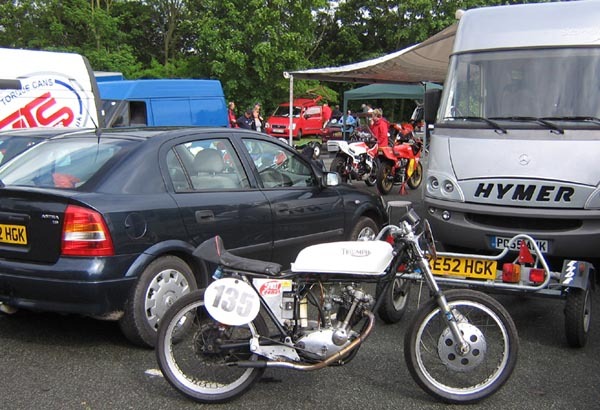 Alas, in the second race the Cub bent a pushrod and, while spares were to hand, it could not be fixed in time for the re-run of the first race. As Sunday's grid positions were taken from the results of that race, that kept me firmly at the back. Most of my class disappeared into the distance while I had fun playing with a Greeves from the 250 class, much faster on the straights but catchable in the corners. I tried adjusting the timing for the last race but went slower instead of faster. 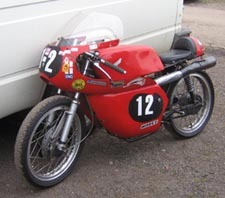 Dave Frost's Greeves that kept me company in the races. Angie's bike was giving her trouble, although it finished the race that I broke down in. 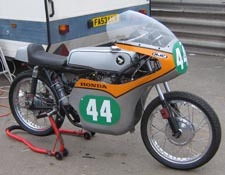 Adrian Warne's bike started the weekend slowly but disappeared into the distance in the last races. Thierry Muller's bike was fast, but didn't finishthe last race. Mick McKay and his Kawasaki. Goes like a train, but handles like a camel, in proper Kawasaki style. We were neck and neck for the third year running. 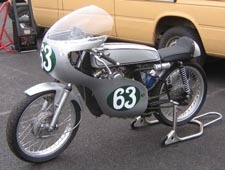 Joan and Joop Van de Pol's rapid Hondas, 200cc and 500cc. I think that the Daytona can be left as it is for Donington, but some extra oomph needs to be found for the Cub. The lap times were competitive until after the repair so there is hope that further rummaging around inside the engine will help. Truly, even the fruit itself is seldom as pear-shaped as things went at Donington. Much of this has to be put down to incompetence or false optimism on my part, but the final twist of the knife was just an outrageously bad piece of luck. Much experimental work had been going on to decide whether the new, thicker pushrods would fit the Cub OK. There was also a suspicion that the valve springs that had cured the valve bounce were too strong and stopping the engine from revving freely, so as an experiment one of the original valve springs was put back in, plus a new one of a slightly different typel. In case of trouble I took spare pushrods and valves. 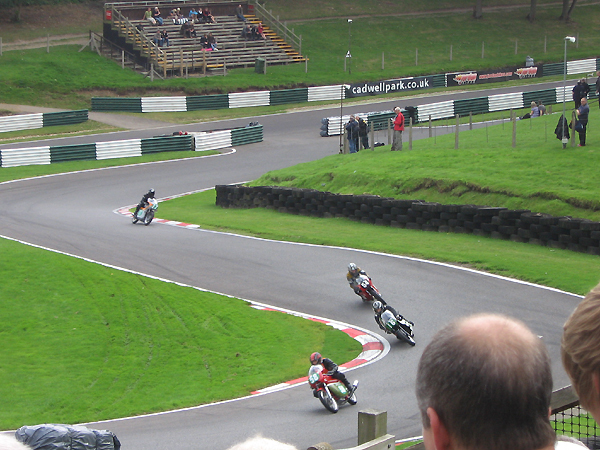 After two laps of practice the bike slowed due to a slightly bent valve then stopped altogether when a pushrod jumped. It was then discovered that I had two spare inlet valves but not the expected exhaust valve. 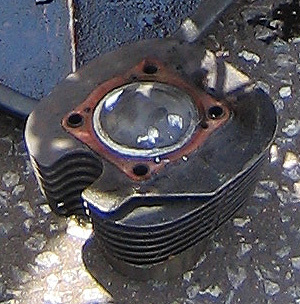 The pushrods had also been horribly mutilated and had spread bits of aluminium throughout the engine, so no racing on the Cub that day. The one positive note was that, with only one cautious warm-up lap and one with a down on power engine, the posted time was not too bad, so maybe the attempted tuning is heading in the right direction if I can get some details right. So, there was still the Daytona to enjoy, and practice revealed that the Melbourne Loop - the extra bit of the circuit we don't normally use - suited me as well as I had hoped. However there was some clutch slip in practice, so with plenty of time before the main race I whipped it apart. The centre seemed too floppy, just worn rubbers or something coming loose at the back? Well, still plenty of time so off it came, there was a bolt coming undone so it was as well to have checked. With Paul checking the plates for flatness and giving them a scrub, I started the reassembly to hear that the parade we could hear was being run during the lunch break rather than after it. Suddenly the pressure was on, time was getting short, and bits started not going back together as easily as they should. My attempt to stay calm was not entirely successful but at last it looked as if we were going to be in the nick of time. The bike fired up straight away, but with massive clutch drag came the realisation that I had asked Jenny to put the clutch plates back while I replaced the alternator, and I had then forgotten to balance the clutch. With no time left I tried turning round to head for the track but the clutch stayed fully engaged, with the front brake on the rear wheel spun as I turned and bike and I went down in a heap as it stalled. Bump-starting it back to life I tried again, this time it threw me off on the other side. 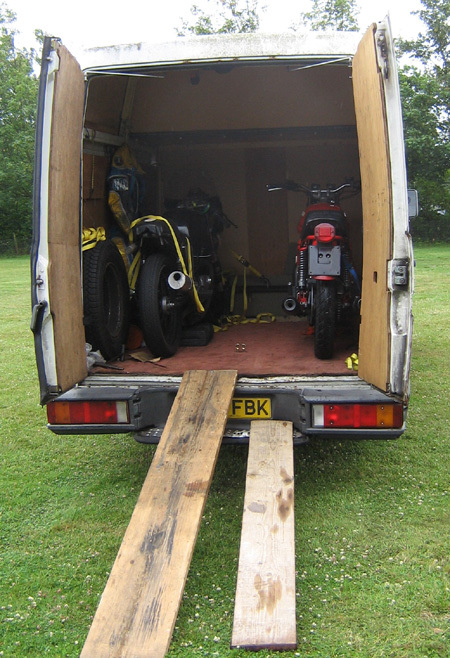 I limped back to the van - could there yet be just time to fix it? - but it was too late. And the second fall had damaged the front brake line. A spare brake hose was fitted and after a lengthy struggle the brake was successfully bled. In the earlier rush, I had also misrouted the alternator wires, which had been cut by the primary chain. Knife, pliers, silicone rubber and cable ties produced a satisfactory bodge, balancing the clutch took no time at all with the cover off, everything was double-checked and to be absolutely ready the footrest rubber which has to be removed to use the paddock stand was replaced, the bike being leant against the van in its customary position. Time to clean hands and tidy up. A few minutes later there was a mighty gust of wind, which blew the bike over - it was a windy day, but that took quite some doing with the fairing sheltered by the van. 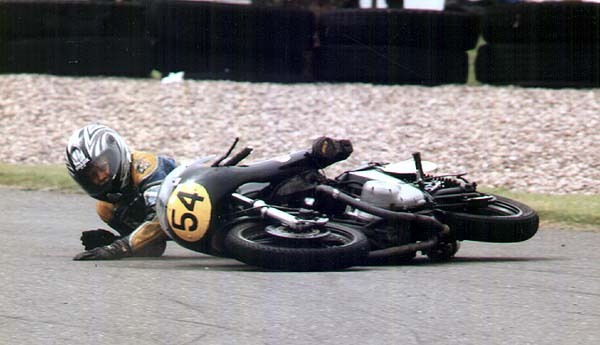 Well, the bike had often been over on its left hand side one way or another, with no damage. 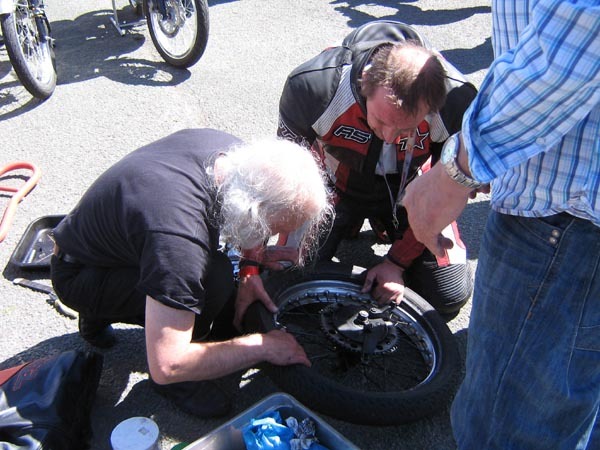 It turned out that the end of the clutch lever had snapped off - OK, I had a spare that could be made to fit; with a few minutes work, that was sorted, we were ready again. Annoyingly, the bike had landed on a tool box which had put a dent in my lovingly crafted aluminium oil tank, but it had not split. The race was called, and I headed for the track. 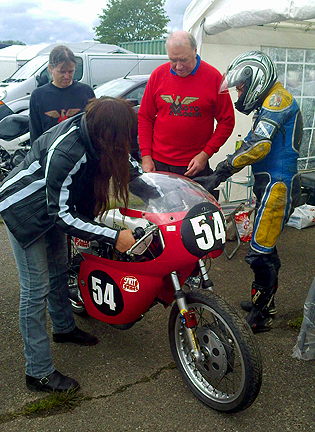 Grid position was allocated, I was in the holding area with the other bikes, warming the engine up. And then I saw that when I revved the engine, a drip of oil would escape from the oil tank. A small drain plug had also been caught by the toolbox, and pushed back just enough to cause the leak. I couldn't go out after all. And that, ladies and gentlemen, was my day at Donington. So, with 5 days to be ready for Thundersprint and the engine in a sorry state, it was as well that I had another engine that I had been running in in Sally's Cub. 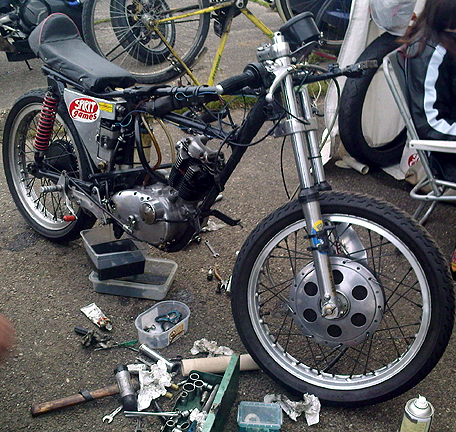 This had revised gearing which I hoped would prove ideal for the event, and a high compression piston, but of course I could not experiment with open exhausts on the local roads, and the cylinder head was borrowed off Sally's bike so had a much smaller carburettor than the race engine. There was just time to do a bit of extra gas-flowing and check that it revved OK in first gear in the driveway. Sometimes it seemed to hold back so the carb was stripped and cleaned and all the electrical connections checked. 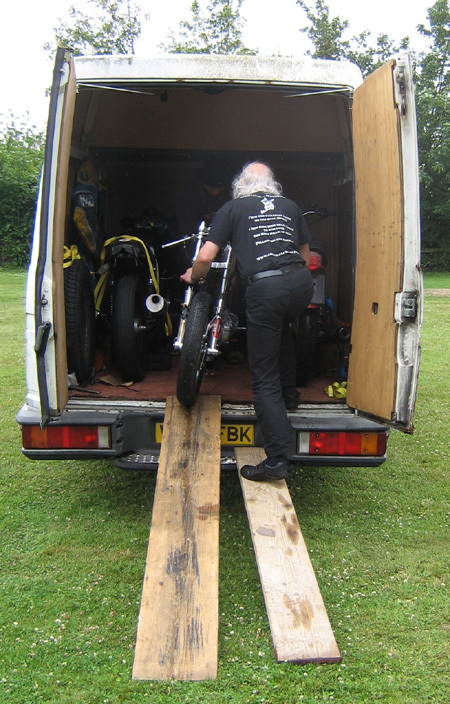 All seemed OK so come Saturday it was time to load the bike onto John's trailer and hope for the best. The weather was scheduled to be pretty foul so with no van to work in there would be little opportunity for fettling between practice and racing. We were pleasantly surprised to find the weather brightening up as we arrived to pitch the tents, and by the time we had driven down the road to look at the Anderton lift - a nearby wonder of Victorian technology - it was downright sunny. We returned to the camp site to park up and head into town to meet my old friend Ben and his son, for food, beer, and the usual gig at the Memorial Hall. 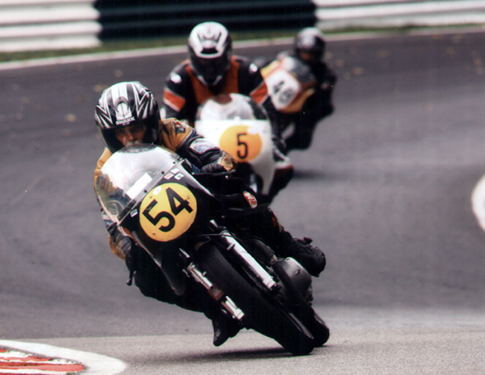 This featured interviews with the younger GP riders taking part in the Thundersprint, and tales of derring-do from the older riders. A local band followed, but most of the audience headed for their beds in readiness for the early start in the morning. Fortified by Newcastle Brown, the only drinkable beer in the place, we stayed to the end to give the band some much needed and well deserved support. There was definitely a "we happy few..." feeling by the finale; as the whole affair was timed to finish before it got too late, there was time for a final pint when we got back to the campsite, which was wonderfully quiet by then. Just time for 5 hours kip before heading back into town. The promised next belt of rain had arrived during the night, but was once again easing up, and we unloaded the bike in a substantially dry paddock. Signing on and scrutineering done, I was able to watch the start of practice while Sally and John tracked down some breakfast - none allowed for me, I was still above racing weight! The track was drying out well, it would certainly be dry for my practice session an hour or two later unless there were further showers. 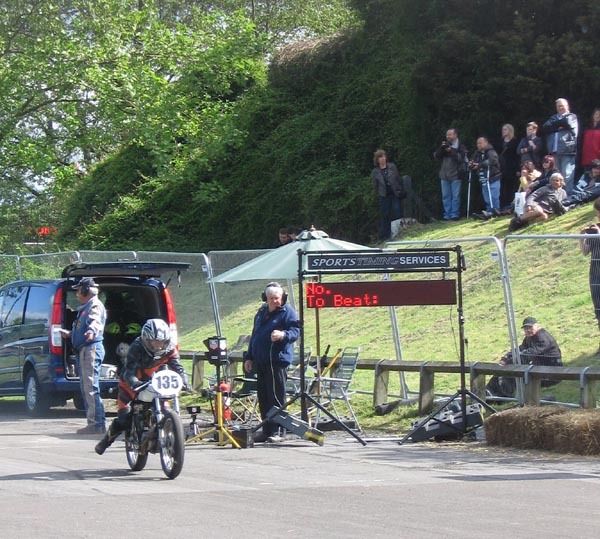 And so it proved, the day brightened steadily, the crowds started to flock in and, best of all, the bike ran sweetly leaving me with the fastest time in the Lightweight group - ahead of the MZ that beat me last year, and the Bantam that had been streets ahead at the Mallory meeting back in March. 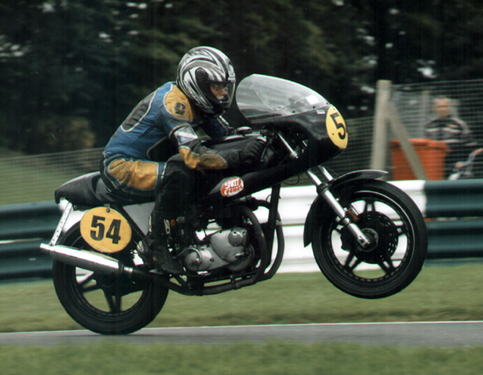 Dave Edwards and his ultra-fast 125 Yamaha were absent, giving the other 10 of us in the class a chance. So I went out to join the cavalcade with a big smile on my face. Upon returning from the obligatory three circuits of the town centre, I spotted a screw sticking out of the rear tyre. A few spots of rain had wetted the tyre, and tiny bubbles were forming as the screw was pulled out. End of big smile. 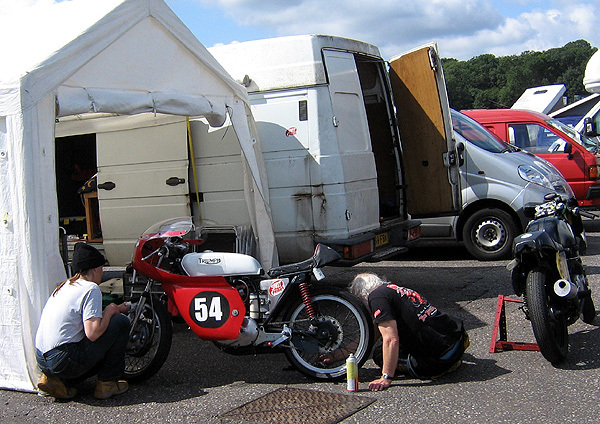 A call on the paddock PA produced a fellow competitor, Oliver Presswood, with a spare tube and some tyre levers, and Robbie, the owner of the Bantam, lent me his paddock stand and helped with changing the tube, as did my friend Paul, taking him back to his days at Waddon Racing many moons ago. 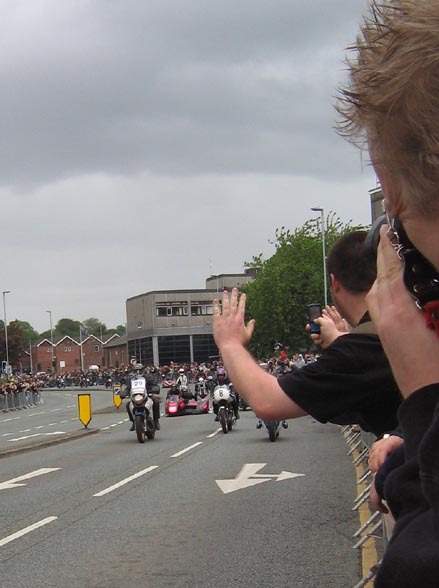 We got the job done in time to watch the GP riders, who were trying quite hard this year, albeit on road bikes and, of course, with strict instructions not to crash and injure themselves. 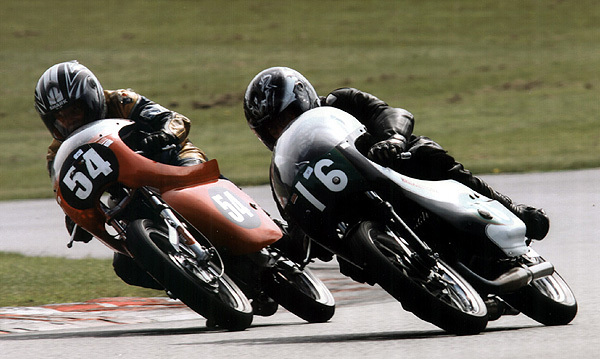 I was going to have to knock a second off my time to beat Danny Webb. 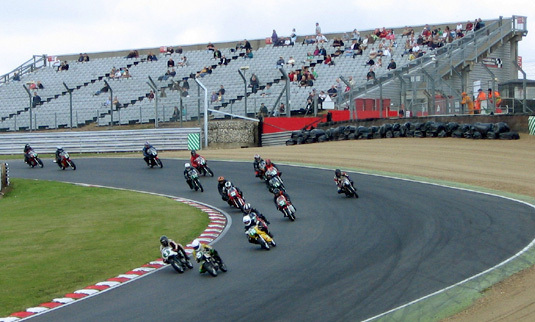 An ideal opportunity to check that the bikes were OK before Brands Hatch in July - with M1 roadworks and the usual perils of the M25, it's a long haul down to Kent so a full weekend's racing would be good. The Daytona needed trying out to ensure that all the repairs to the chassis parts and brakes were up to scratch, and I was keen to see how the Cub's Thundersprint engine worked when geared up for a longer circuit. Well, the Daytona felt fine, and towards the end of a pleasantly sunny day some rain provided the opportunity to check the wet weather handling too. 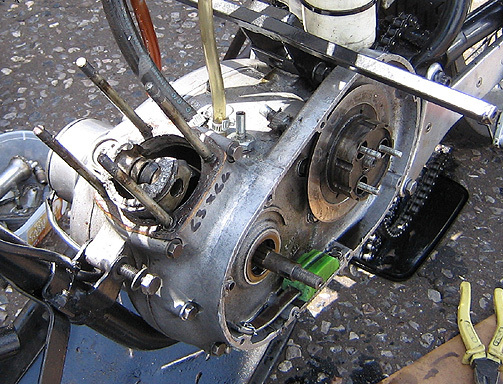 On the Cub, the slightly different gearing was not as suitable as the closer ratios normally fitted, which was useful information. It also felt pretty much as fast as with the larger carburettor and I was looking forward to comparing lap times once it was fully warmed up. Unfortunately, on the fifth lap, it seized. There goes my rare and precious 11:1 piston, and the barrel will probably need a rebore too. 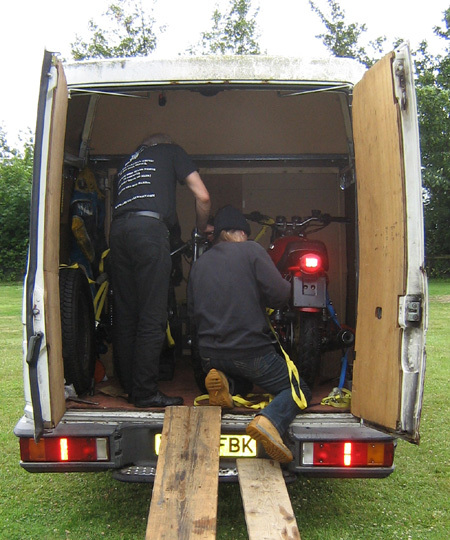 As Jenny's race bike is not yet ready she took her road Morini, this gave us a chance to check we could get three bikes in the van. Strapping in is easier without the fairing on. One of the problems at this time of year is that Sally has a long-standing arrangement to slope off to watch Wimbledon, and sundry extra trials and tribulations at the shop have led to a distinct shortage of spare time. 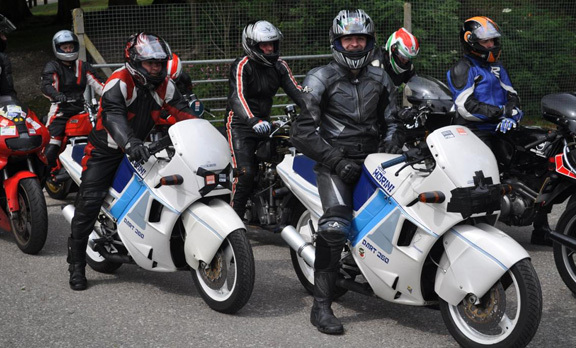 In addition, the Saltbox Motorcycle Club was celebrating its 50th anniversary - while the club faded away about 20 years ago, many members have kept in touch and the chance to meet up with lots of old friends was not to be missed. With the reunion being in a field in Surrey, it made sense to visit other friends and relatives darn sarf too, so that was a long weekend used up, most enjoyably it must be said. Eventually the main race engine was back together, seeming OK but with some misgivings about whether all the bits of aluminium cleaned out of it had offended the big end. I had checked it twice but it there was a hint of knocky-rattliness. At least I had a spare bottom end together, a spare head and spare transmission. 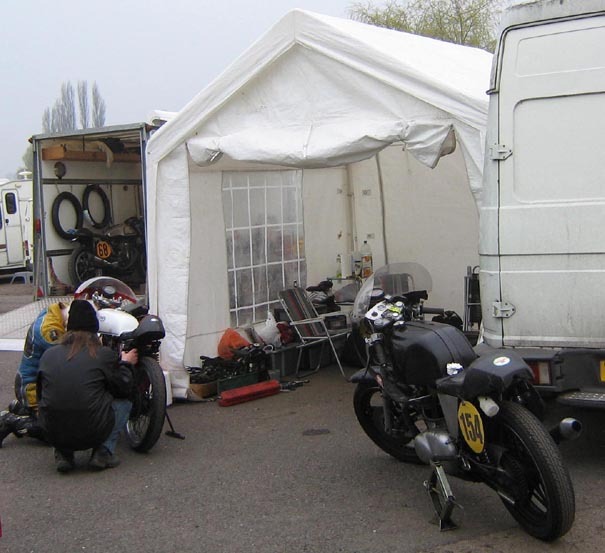 It was damp and distinctly breezy on Friday evening as we put the gazebo up next to the van and got the bikes ready for scrutineering and noise testing in the morning, but Saturday dawned clear and bright. No problems in the practice sessions, apart from some slight vibration and a strange feeling at the back end. Everything was checked for tightness, the back tyre had worn in a peculiar way and some curly bits (technical term) were filed off on the right hand side in time for the first race. A bright and sunny start to the day, bikes ready to race, just a last minute clean. 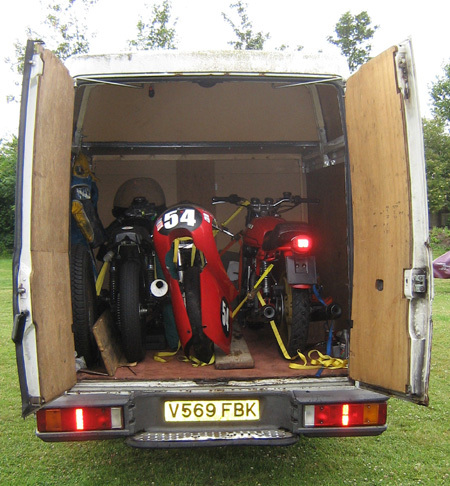 Both bikes went pretty well though not quite well enough. The first race in both classes used current championship position to determine grid position, and since I had missed all but one round so far I started at the back The Cub was handling especially pleasantly and I was able to move up several places on the first lap, and then chased a group of 200cc bikes - the ones I'm meant to beat - while picking off a couple more of the slower 250's. I was constantly closing up into the bends but didn't have the acceleration out of them to make it stick, and in the end achieved the distinction of coming 7th out of 6. OK, so there were a few extra entrants not listed in the programme, but it was still not what I'd had in mind. Just one second a lap faster would have moved me up 4 places, I was sure I was getting faster round the corners but while the bike felt OK the lap times showed a slight slowing towards the end of each race. Then, just before crossing the line at the end of the third race, there was an expensive-sounding bang, which turned out to be the top coming off the piston. They are meant to be connected! The suspicion is that when a valve hit it earlier in the year, although it looked OK, it had a hidden crack underneath which had been the cause of the rattle and the slight slowing when hot. I have now run out of spare pistons, like an idiot I didn't grab two spotted on the Internerd last year and they are getting alarmingly scarce. 500 Class: starting the chase. On the Daytona I had a slide at Clearways and was scraping the toe slider round Paddock Bend at a satisfyingly high speed by race 3, but the gearbox was playing up and I'd lost top gear. As this made no difference to the lap times I could clearly do with gearing down for Brands in future. Alas, a couple of laps into race 4 it was clearly getting worse so I pulled in, investigation has revealed that a missing circlip had allowed a bearing to move. A problem of having an engine put together by the aforementioned idiot. 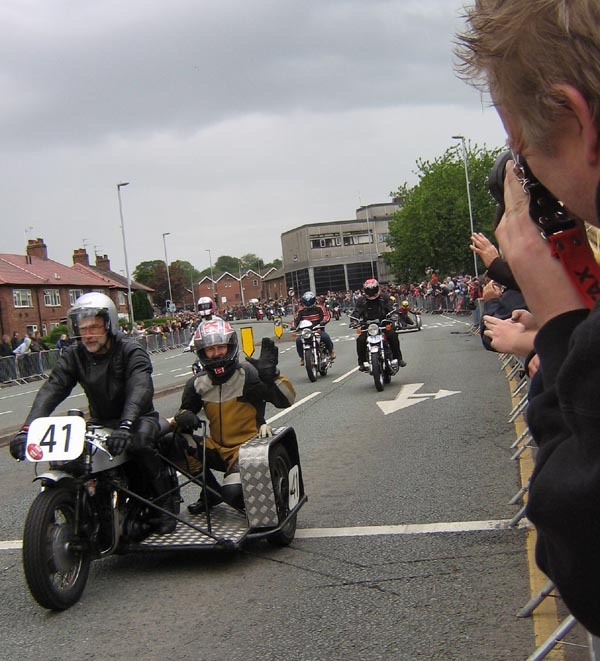 Hopefully it will all work OK again with a modest amount of work, now I have to phone round on the piston hunt in time for Darley Moor in August. 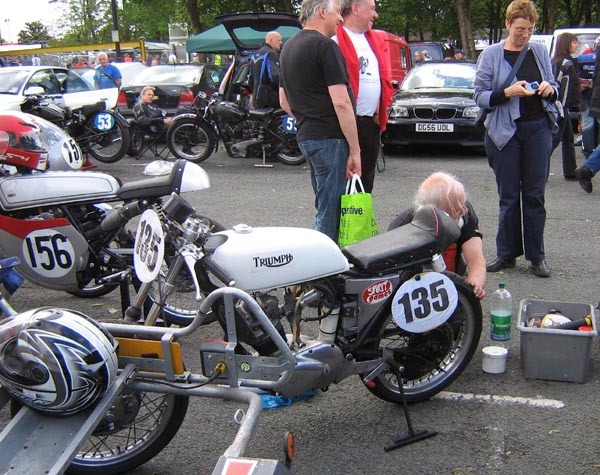 My first time racing at Darley Moor and, as with other first-timers I spoke to, I was impressed – despite the lack of ups and downs and basic triangular shape, the extra twiddly bits added make it an interesting little circuit. And I had plenty of ups and downs of my own, in any case. It was The Weekend of the Gear Problems – what had been a minor sign of some worn dogs in the Cub gearbox decided to change to full-blown jumping out of second gear. 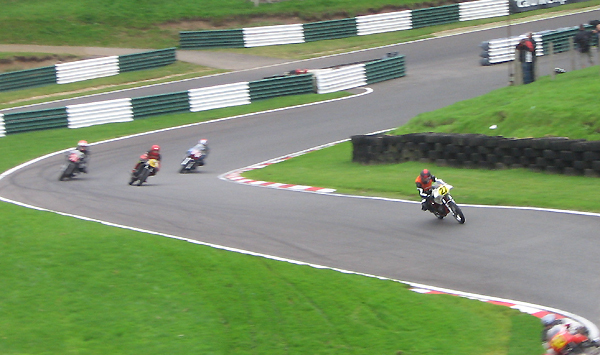 At Cadwell Park you just stick the Cub in top gear and pretty much leave it there, but at Darley Moor second gear is used a lot. The result was a lack of acceleration resulting in an inability to keep up with my usual protagonists, let alone the faster guys in my class. I could have done with a higher gear down the longest straight too, though the lower gearing suits the rest of the circuit – the limitations of a four-speed gearbox making themselves felt. Just to add to the fun, the Cub ate another pushrod so it seems that the thicker ones are still catching on something. Some new thinner ones needed shortening but as we were close enough to home to be returning for a good kip anyway the lathe was put to use while we were there. So on Sunday the valve clearances were back to being correct, I had found a way of mitigating the gear problem to some extent, and lo and behold the lap times were just as bad. And there is a mystery oil leak which looks like the head gasket blowing although there is no sign of it otherwise. On Saturday evening there was a pushbike race round the circuit which I felt compelled to enter on my clapped-out mountain bike bought second-hand 20 years ago. This, I thought, would make me have another go at sorting out the gears on that bike but time spent on the other bikes meant that I only had two to use instead of 15. I didn't do too well, but it did at least confirm that my heart, lungs and legs are still functional. Those of you following the harrowing saga of this year's racing will be aware that I had a go at destroying the Daytona's gearbox at the last meeting; it looked as though I had got away with it but third gear turned out to be entirely unreliable. Fortunately the Daytona has a wide spread of power and revving it hard in second allowed me to skip swiftly through third into top, resulting in only a slight loss of time. This difference was just enough to keep me behind two of the bikes in my class rather than in front, but at least I was close enough to have an enjoyable chase and avoided coming last. In the first race this needed some very late braking on the last lap and as I slid down the track it looked as though I had overdone it, but a line of oil dropped by a Kawasaki was the culprit. No great damage done and at least it gave me the satisfaction of being able to complain about these oily old Jap bikes, not something a Triumph rider often gets to do. Well, the end of an imperfect racing year, going to Snetterton next month would be too masochistic by far. I had high hopes of having all four gears on both bikes, which were promptly dashed in practice; the Cub now stays in second gear but jumps out of third, though at least not as badly. The Daytona jumps out of third every bit as enthusiastically with its expensive new perfect-looking gear cluster as it did with its obviously worn predecessor. Making the best of a bad job, I had some fun on the Daytona, once again not quite fast enough to be up with my usual competitors but at least able to have some good dices near the back of the field. Several of the bikes and riders in the 500cc air cooled post-classic class are now way out of my league as demonstrated by my friend on a Morini, who due to a numbers mix-up started near the front of the grid among the fastest 1300cc riders, proceeded to go 3 seconds a lap faster than either of us had ever gone before, and was still not in the top three of our class. In search of more power I tried different jets in the carburettors, it went slower and developed a misfire. I returned the settings to normal and sorted a suspect electrical connection before the last race, it felt happier but still had the misfire. On Saturday the Daytona was still going relatively well. The Cub, meanwhile, was also going more slowly than usual and attempts to check the timing were thwarted by the strobe gun playing up - again. This is the new gun bought when the old one played up in exactly the same way, the problem comes and goes and no-one can think of a reason why. Frustration. Some parts had been changed in the hope of curing a mystery oil leak with no success so the top end of the engine was stripped down on Saturday night, work ceasing when it got too dark. 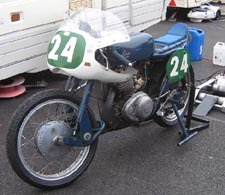 The first race on Sunday was sacrificed to the cause of not rushing the rebuild, on the warm-up lap it felt OK and then halfway round the first lap the carburettor fell off ; the clip seemed perfectly tight but the mounting rubber seemed strangely slippery. 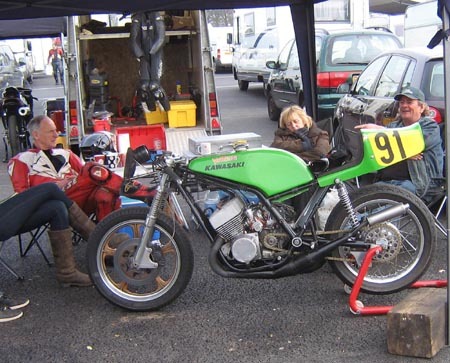 By the time it was re-attached with the aid of a marshal's Swiss Army penknife it was the last lap, the oil leak seemed not to have returned but the bike had had insufficient thrashing to be sure. And what was that slipperiness all about? More frustration. The Cub chasing around. At least the weather held up. 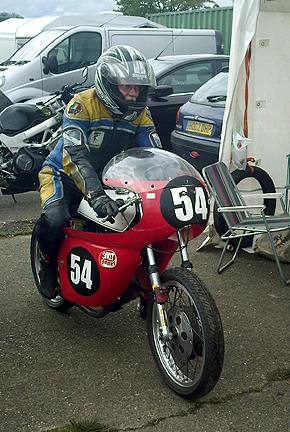 Pete on his 350cc Morini showing the 500cc class how it's done.